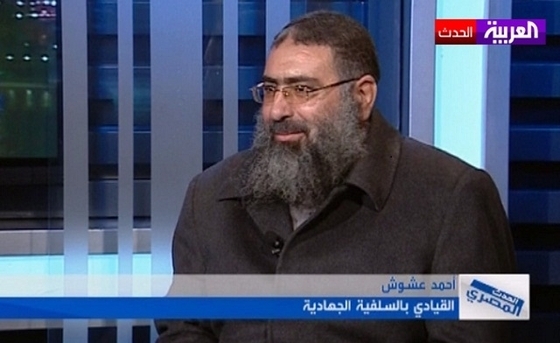 Ahmed Ashush, a high-profile jihadist who has longstanding ties to al Qaeda and who has founded Ansar al Sharia Egypt. Image from Al Arabiya News. Ansar al Sharia Egypt has published its founding statement online. The group says that “preaching and jihad are two wings that are indispensable to the spread of Islam,” according to a translation prepared by the SITE Intelligence Group. And the group outlines 16 goals with that two-pronged approach in mind. The founding statement is signed by Ahmed Ashush, a high-profile jihadist who has longstanding ties to al Qaeda. During a recent television appearance, Ashush criticized Egyptian president Mohamed Morsi for not imposing sharia law. Ashush has consistently denounced the democratic process as well. According to the Middle East Media Research Institute (MEMRI), Ashush was a “close friend of Muhammad ‘Atef, aka Abu Hafs Al-Masri, one of al Qaeda’s most prominent military commanders.” Abu Hafs was killed during the US-led bombing campaign in Afghanistan in late 2001. Ashush traveled to Afghanistan in 1989 to wage jihad, MEMRI reports, and he lived in Abu Hafs al Masri’s home. Ashush also became “acquainted with Osama bin Laden and Ayman al Zawawhiri” before returning to Egypt to found a jihadist group. Ashush was imprisoned during the 1990s and released after Hosni Mubarak’s fall from power. In 2007, a prominent jihadist ideologue named Sayyid Imam al Sharif (also known as Dr. Fadl) published a critique of al Qaeda’s approach to waging jihad. Al Qaeda has been criticized by outsiders repeatedly, but Sharif’s critique was especially powerful given his longstanding relationship with Ayman al Zawahiri. Ashush’s cosignatories included Mohammed al Zawahiri, the younger brother of al Qaeda emir Ayman al Zawahiri, and another al Qaeda-linked jihadist named Sheikh Tawfiq al ‘Afani. Both the younger Zawahiri and al ‘Afani helped incite protesters on Sept. 11, 2012 in Cairo. Muhammad Jamal al Kashef, an Egyptian Islamic Jihad (EIJ) terrorist who was reportedly involved in the attack on the US Consulate in Benghazi later that same day, also signed the rebuke of Sharif. It didn’t take long for Mohammed al Zawahiri and Ashush to begin working together publicly. 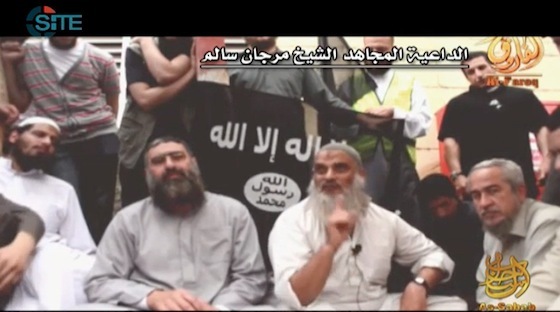 Mohammed al Zawahiri (right, in front of an al Qaeda in Iraq flag), Sheikh ‘Adil Shehato (center, bottom), and Ahmad Ashush (center, speaking on microphone), from an As Sahab video released on Sept. 10, 2012. 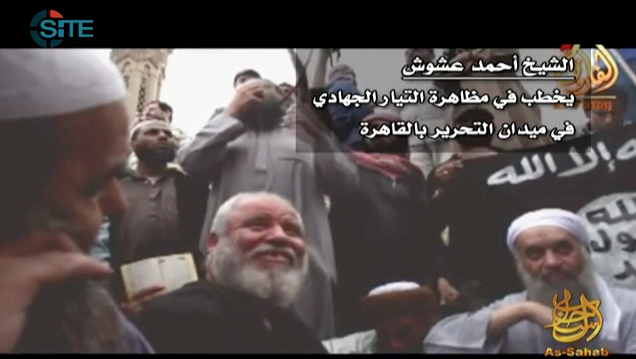 In April 2012, Al Faroq Media posted a video of Mohammed al Zawahiri and Ashush proselytizing in Cairo. The video also showed Sheikh Adel Shehato, a longtime Egyptian Islamic Jihad official who was recently arrested on terrorism charges and who also attended the 9/11 Cairo protest, as well as Murjan Salim, a senior Egyptian jihadist who has his own ties to al Qaeda. Ashush told the crowd that the Salafist-jihadist movement led the way in “revolting against the apostate regimes.” Ashush then called on those in attendance to pay respect to the leaders of the movement: Osama bin Laden and Ayman al Zawahiri. In a June 2012 message addressed to Egyptians, Ashush praised the true jihadists who “are still on the path” and “cannot be defeated by desires because they raise the banner high regardless of who agrees or disagrees with them.” Ashush dismissed a video that claimed the Egyptian jihadist movement supported Ahmad Shafiq, a former official in Hosni Mubarak’s regime, for president of Egypt. Murjan Salim (center right) and Ahmad ‘Ashush (center left) as shown in an al Qaeda video. “On the path you will find the leader of the mujahidin Osama bin Laden, the brave leader Abu Musab al Zarqawi, and many other brave and honorable examples,” Ashush said in the June 2012 message. The following month, in July 2012, Ashush published a criticism of Ennahda leader Rachid Ghannouchi. Ashush took issue with Ghannouchi’s criticism of Ayman al Zawahiri, who Ghannouchi described as a “disaster to Islam and Muslims” and an “example of Islamic extremism.” Ashush responded by accusing Ghannouchi of hypocrisy and of falling into the trap of democracy, which he claims the US uses to lead Muslims astray. In his harsh response to Ghannouchi, Ashush summarized Ayman al Zawahiri’s life, portraying the al Qaeda leader as a humble servant who was willing to cede leadership of al Qaeda to Osama bin Laden. Zawahiri is “not a man of the world, seeking a position or leadership, but rather a jihadist, who does his part wherever he is,” Ashush wrote. Given Ashush’s penchant for praising Ayman al Zawahiri and Osama bin Laden, it is not surprising to see that al Qaeda has returned the favor. Al Qaeda has repeatedly spliced video of Ashush preaching in Egypt with clips of Zawahiri pontificating about Egyptian affairs. Zawahiri uses the clips of Ashush to reinforce his arguments. Ayman al Zawahiri’s Sept. 10 video is a case in point. Timed to coincide with the eleventh anniversary of the Sept. 11, 2001 attacks, Zawahiri eulogized Abu Yahya al Libi, a senior al Qaeda leader who was killed in a drone strike several months earlier. Zawahiri called for jihadists to avenge al Libi. Zawahiri also claimed that while al Qaeda has suffered losses, the organization’s ideology is spreading. Therefore, in Zawahiri’s eyes, the US has not defeated al Qaeda. Immediately after Zawahiri spoke these words, the al Qaeda video cuts to a clip of Ashush. Sitting beside Ashush as he lionized bin Laden in the video clip were Sheikh Adel Shehato and Mohammed al Zawahiri. Shortly after Ayman al Zawahiri’s Sept. 10 eulogy of Abu Yahya al Libi was released online, Ashush published his own tribute. Ashush praised the fallen al Qaeda leader as a “hero,” asking that God accept al Libi “among the noble ones, martyrs, and righteous ones for he is their companion.” Ashush promised that the jihad would continue even after al Libi’s martyrdom. “Carrying out jihad is a duty until we conquer Rome and transform the Churches in America to mosques, in which the Koran flourishes,” Ashush said. Since the Sept. 10 video, al Qaeda has continued to trumpet clips of Ashush. A two-part video starring Ayman al Zawahiri that was released on Oct. 24 includes nine video clips showing Ashush and other Egyptian jihadists, including Mohammed al Zawahiri. Ashush’s message dovetails neatly with Ayman al Zawahiri’s. Both have called for the immediate implementation of sharia law inside Egypt and they have criticized the Muslim Brotherhood-led government for not aggressively seeking to impose it. The call to be ruled according to sharia has become a key pillar of al Qaeda’s post-Arab Spring agenda, and provides the group with a wedge issue it can use to criticize other, politically ascendant Islamists. Al Qaeda’s brand has also been tarnished throughout much of the Middle East and North Africa as the organization’s principal victims have been Muslims. As a result, al Qaeda-linked groups have adopted the Ansar al Sharia (meaning “Partisans of Islamic law”) brand in other countries. In Yemen, for instance, Ansar al Sharia is simply an alias for al Qaeda in the Arabian Peninsula. Ansar al Sharia militia groups with links to al Qaeda in the Islamic Maghreb have been established in Libya. Earlier this month, the Moroccan government broke up an Ansar al Sharia cell that it said has ties to al Qaeda. And Ansar al Sharia Tunisia is led by a terrorist whose ties to al Qaeda have been recognized by the United Nations. It is not a coincidence, therefore, that a jihadist whose vision has been endorsed by al Qaeda in its videos, and who openly praises al Qaeda’s leaders, is the head of Ansar al Sharia Egypt.